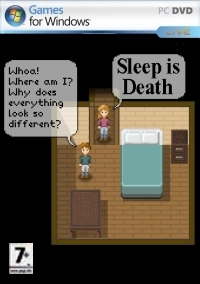 Sleep is Death does away with artificial intelligence and level design by letting one of the players control this as you go. Difficult to explain but endlessly flexible to play, Sleep is Death asks a lot of you , but then creates something genuinely unique. Sleep is Death is an unusual two-player game - one player sets up and then controls scenarios for a second player to play. 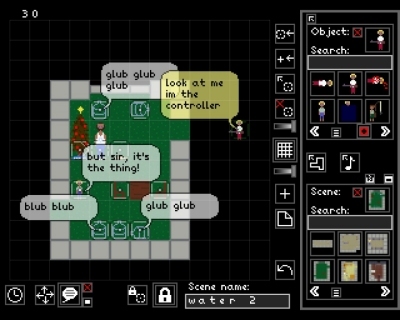 As the story rolls, the player and the controller have a limited amount of time to execute their go - movements, actions and dialogue. Having a human, rather than the computer controlling the action makes for a very different experience. 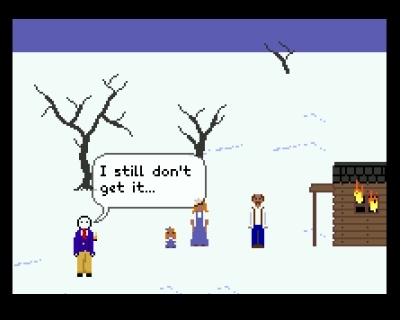 It's really more of a collaborative storytelling experience than a traditional video game. I admire the concept and think it has a lot of potential. 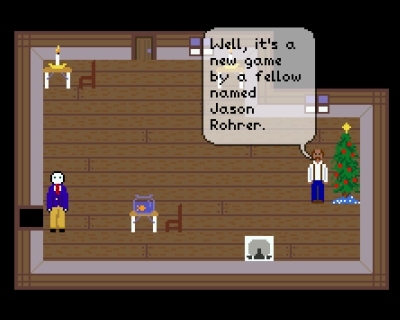 But it asks a lot of its players, and I found it a bit stressful to set up a story and act within a time-limit. Children happily create their own worlds and games. At some point though they learn to fear judgement, and end up curtailing their imaginative storytelling. Sleep is Death reverses this and invites us all to tell stories again like we did when we were young. Setting up a game to be played, it's quite intimidating to be faced with a blank slate. Thankfully, my partner and I actually met playing Dungeons and Dragons, so we already have some experience with shared storytelling. This may conjure up images of nerdy-looking people rolling dice but we prefer to focus on the characterisation and narrative elements of role playing which has more in common with improvised theatre than tactical war gaming. Sleep is Death has a lot in common with role playing. 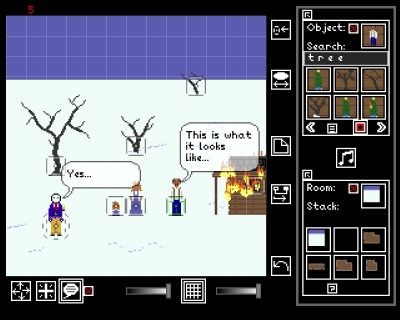 It adds some basic graphics, and imposes a strict time limit to keep the story moving. But in essence the concept is very similar. In the past I've enjoyed pencil-and-paper role playing but was a little skeptical about forcing that into a new format. Sleep is Death has a lot in common with role playing. I dithered for quite a while considering what to produce. I wanted to create something unique for my partner. I imagined he would appreciate an intricate world to explore, with a clever and emotional story. I wanted enough worked out in advance to make the game run as smoothly as possible, while still allowing plenty of freedom. I was soon floundering though due to my perfectionism. It's not a game that rewards perfectionism - I eventually gave in and simplified my ideas, reverted to stick-figures and a predominately black-and-white palette. My role playing bias kept reminding me I could have created fleshed out scenes more quickly, simply by describing them in words and bypassing the Sleep is Death interface altogether. I to set my story in an environment my partner was already familiar with. I created a rough version of Pokke Village from Monster Hunter Freedom 2 and Freedom Unite. The player took on the role of a new hunter, who arrived in the village only to discover there wasn't anything left to hunt. They had to try to restore the ecology of the area and restore hope for the recovery of the village. Once finished we both sat down at our computers to play. It went well, although the time limit was tricky. It is hard to explain anything complex in 30 seconds, especially if I wasted a few seconds thinking about it. This really kept the pressure on, and forced me to keep conversations simpler than I had envisioned them. You will get as much out of Sleep is Death as you put in, and personal experience will vary greatly. Sleep is Death will garner a strong cult following among people who want to invest in making their own stories. Sleep is Death is distributed using a pay-what-you-want model (minimum price USD1.75), so it's cheaply available to anyone who has even a vague interest. For my eclectic tasks, I appreciate Sleep is Death more as a concept than the reality of playing it. It's a unique game that really challenges the idea of what a video game is, and what people might be able to get out of gaming. It reminded me to exercise my imagination, and that barriers and fears to creativity are often artificial.